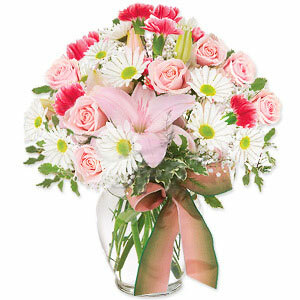 Roses, lilies, carnations and daisies, aesthetically arranged with green fillers, constitute this lovely bouquet that is bound to impress the reciever with its medley of flowers and colors. Gift it to a loved one and see the delight light their eyes. Please Note: Vase may vary depending on the availability.